Having experienced many nights like that as an Ireland player, I could almost hear the players talking as they came off the pitch last night. "That was horrible." Horrible to watch, and even worse to play in. It was a horrible pitch, horrible windy conditions and, to be honest, a horrible team to play against. Because they are so bad, it actually makes them more difficult to play against. If they don't know what to do with the ball, how are you supposed to know what they will do? I don't think Ireland's players, their manager and his staff will have been too bothered about the performance - or the scoreline - as they headed home from Gibraltar last night. All that matters is that Ireland are up and running for this European qualifying campaign with a win, against a side and on a nasty surface that is going to test all the visitors to The Rock. They will be delighted with the win and even more pleased to get back on the grass in the Aviva Stadium. It is easy to sit and watch an Ireland performance like that and criticise and have a go at the team and the players. There will be plenty written and discussed about the start of Mick McCarthy's second reign as the manager. But I have played in games like that, on artificial pitches in particular, and they are absolutely awful. They are not just a leveller for teams like Gibraltar, they actually give them an advantage, especially in gale-force winds like last night. International football should not be played on plastic, it's as simple as that. Trying to keep control of a football on a 4G surface is like trying to control a sliotar thrown at you at full speed from 10 yards away. It took our lads a good half-hour to get used to the pace of the pitch and the conditions, and even then it is never easy because the ball pings everywhere and is virtually impossible to control. Gibraltar then played so deep that we couldn't run behind them and the ball didn't stop, or hold up as it would on grass. Of course Mick would have preferred an assured and comfortable start to the game, and maybe a goal to ease the nerves, but I suspect that once they arrived at the stadium yesterday afternoon, he knew what they were in for. A bloody hard 90 minutes, and so it proved. The gaffer always looks more anxious than he actually is. You could hear him barking instructions and whistling throughout the game, but he will have remained calm and, at half-time, there will have been no panic or anxiety in the dressing room. The fact that the team was back out for the second half early points to that. The instructions will have remained the same - keep playing in areas where we can get runners in and we will break them down. For the most part, I thought Mick had a good evening on the line, with how he set his team up and his substitutions. One thing - I thought he might have been tempted to bring on James Collins and go for a target man when he withdrew Seán Maguire. Busy and always on the edge, Maguire did well and has more minutes in his legs, which is important. After four days, the winning goal had all the hallmarks of a goal from one of Mick's teams. After David McGoldrick's wide run, he managed a good pick-out to find the midfielder running into the box - Jeff Hendrick producing a nice composed finish. It is always said that goalkeepers and defenders must concentrate and stay focused for 90 minutes and we certainly saw why that is so vital when Darren Randolph made his one save just after half-time. It was a spectacular stop. How he managed to keep out Roy Chipolina's firm header from a corner is beyond me because he must have been freezing and stiff as a board. I really could not see them scoring before or after that, so it was as important as Hendrick's winning goal. Having been in a dressing room many times with Mick, I know he will have told the boys to put that game behind them and remind them that the job this week is only half-done. He knows it was not pretty and he will be happy to move on. 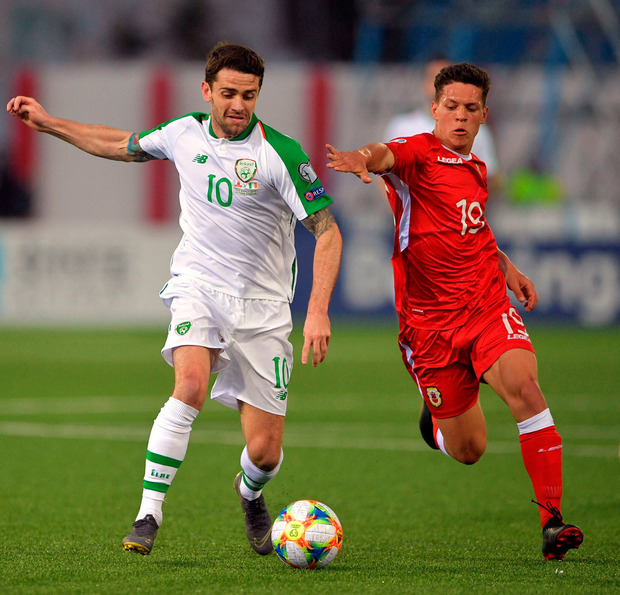 There is plenty to work on of course but, in those conditions and on that pitch, it is hard to judge the combinations put in place, like Stevens and McClean on the left or Coleman and Doherty on the right. For the game against Georgia, on Tuesday, I think he will go 4-4-1-1 and having watched their game against Switzerland, he knows they will sit back and try catch us on the counter-attack with their two wingers and lone striker. Ireland will have to break them down, try to keep the tempo up and look for the Georgians to make mistakes. I am sure the Aviva Stadium crowd will give Mick a warm welcome back and get behind the lads, but we will all need to be patient during what could be another testing night. An edgy crowd will only lead to an edgy team.